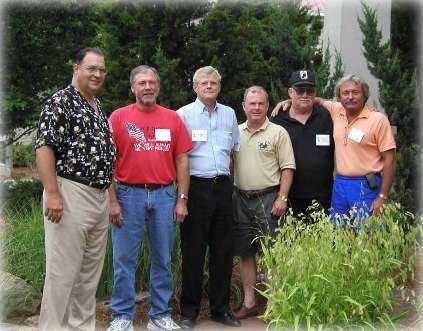 I had the honor of attending the Mike Company Association reunion in Atlanta in July 2002, where I met two more of the men that served on Hill 25, and received an unbelievable surprise! Being at the reunion was overwhelming. I have Rich to thank yet again, for making us aware of the reunion and for acting as my host. Meeting Doc and Chuck (Davis' Squad Leader) was a real honor. These men have given so much of themselves, yet they find more to give to my family. Chuck had a special surprise for the Jones family. 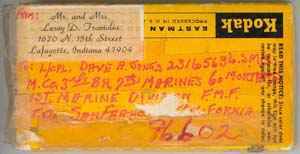 Around October 1967, Davis had given Chuck some film to send home to his parents to be developed. The attack on November 2nd prevented the developed slides from being returned, so they were kept by Chuck and his parents for many years. Chuck presented those slides to me at the reunion, and we present them here to be seen for the first time. This is the package of slides, addressed for return some 35 years ago.